Julie Muela-Farris was the kid who scribbled with crayons on the back of placemats at Denny’s and drew on the walls of her family’s home. In elementary school, teachers would ask what she wanted to be when she grew up. She always answered the same: an artist. 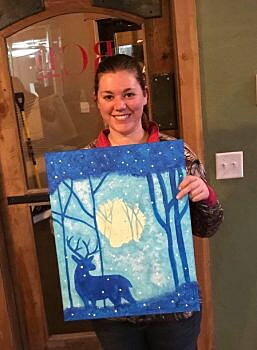 As long as she can remember, she held painter Bob Ross close to her heart. “I think I came out of the womb wanting to create, or paint, or draw, or make a mess, I’m not really sure,” Muela-Farris said. Her passion turned into a career when she started her own mobile paint party business in Missoula after working for a paint party franchise in California for two years. More days than not find Muela-Farris loading her Jeep with art supplies and traveling to an area home, business, fundraiser or other event, helping clients create a display-worthy painting. Since opening in 2017, she’s hosted over 425 parties and instructed more than 8,000 painters. She is the only instructor for her business, and brings all the supplies to each party. 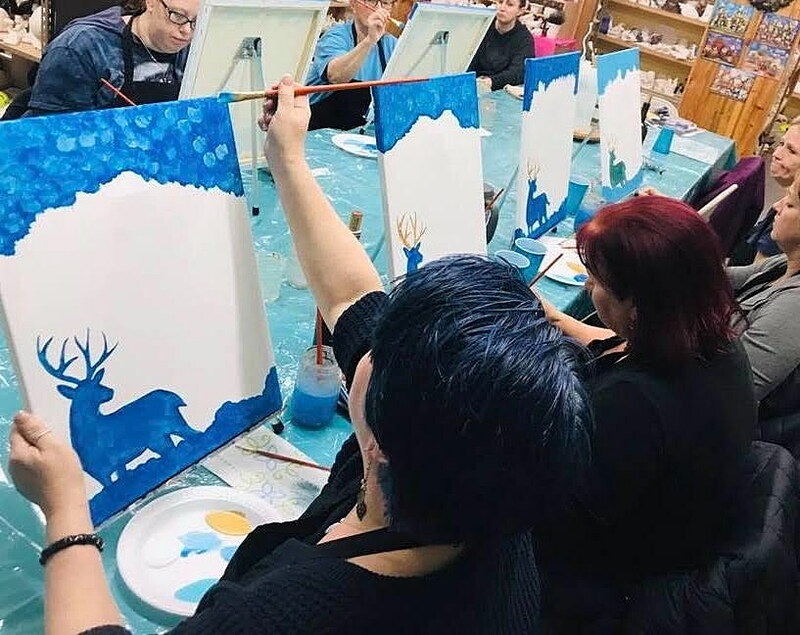 Paint parties can be used for birthdays, reunions and fundraisers, and each painter can add something unique. Her husband, for example, always finds a way to incorporate the Batman symbol into his paintings. She remembers helping one woman add a silhouette of a fisherman in her painting of a river. After she went to community college for art in Sacramento, California, she worked in financial services and, after experiencing some hardship in her life, her husband encouraged her to take a few art classes. After that, she started teaching for a franchise, packing her blue Volkswagen full of art supplies and driving to the studio. She visited art museums and Zootown Arts Community Center in Missoula, and was impressed and excited by Missoula’s creativity and emphasis on artwork. She was able to witness the ZACC’s Monster Project, where painters help schoolchildren paint monsters from their imagination. They moved soon after, and opened Missoula’s first mobile paint party studio, called Paint pARTy with Julie Muela-Farris. She hosts a minimum of eight painters at a time at $25 each and can customize templates for painters to imitate. She will go almost anywhere to host a party. Her goal is to share the benefits of art with others. In a world full of what she calls left-brained technology and responsibilities, creating something of your own can help relieve stress and have some fun.